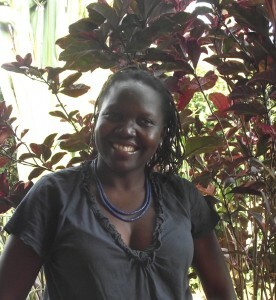 Thousands of families in northern Uganda recognize themselves in the words of writer Beatrice Lamwaka. The region, which had for some twenty years been terrorized by the Lord’s Resistance Army, is now afflicted in peacetime by an unusually high number of suicides. Silence is a national character trait of the northern residents. It proved not to be a solution for trauma. Lamwaka describes in Butterfly Dreams the return of a teen, abducted by the Lord’s Resistance Army (LRA) which had kidnapped more than 20,000 children and transformed them into killing machines. The short story is based on the abduction and return of her 13 year-old brother. He never talked about his experiences. His family did not ask. They also did not tell him that his Tipu, his soul, had been buried according to tradition. Everyone assumed he was dead. This was to happen two years later when he died of pneumonia. “We, Acholi, do not talk about what others know. Nobody wants to talk about a child who had been kidnapped. Such a child was a killer.” says the 35 year old writer about her people which form the majority tribe in northern Uganda. The LRA left Uganda some five years ago in a significantly reduced number, and moved to the Central African Republic and Congo. The people left the displaced camps in which they had gathered for protection and tried to resume their lives. But that proves not to be easy. In 2012 more than fifty people took their lives in and around the town of Gulu, a region of 400.000 inhabitants. “We fear that the number is twice as high. Families prefer to keep it secret because suicide is a taboo in our culture,” said Francisco Watdok Awori, a local councillor who helped with research into the suicides. “Last year it was more or less the same number, usually people aged between 25 and 40 years.” Research shows that trauma, poverty and alcohol abuse are the main reasons for suicides or attempts. Judy sits on a wooden stool under a cluster of banana trees. Her three year old son plays at her feet. There are no toys because the family is too poor. The 24 year old mother had recently jumped off a bridge into a river. A passerby had rescued her; that was not what she intended. Gulu is only nine miles away, easy to walk. But Judy has no idea that professional help exists there for trauma victims. A traditional healer told her that she was possessed by spirits which he could not chase away. The church disappointed her as well. A priest whom she told about her despair advised her to go home and focus on raising her child. Her husband had also unsuccessfully tried to commit suicide. When will they make another attempt? The father of Beatrice Lamwaka was proud of her after he had read the story, but he never mentioned the content. Ten minutes walk from Judy’s house Okello is working up a sweat. He bakes mud bricks in the sun. The pit next to his house from where he digs out the clay is deep. Okello has to dig deeper because he does not own more land than where his home stands, and where the pit lies. His brother hanged himself a few months ago from a tree because he did not know how to go on with life. He neglected his children and battered his wife until one day she walked away. He could not keep off the booze. “We had a large piece of land before we went to live in a camp for displaced people because it was safer. After the peace we returned, but our land had been fenced and expropriated by someone from the capital city Kampala”, says Okello (42) sitting on a tree stump. He scrapes some dried mud from his leg with a few twigs. The land was owned for generations by his family, but papers of ownership were never acquired. Such a document was hardly in possession of anyone in the rural areas of the north. Okello is too poor to institute a lawsuit in an effort to retrieve his land. Okello takes care of the five children from his brother. He himself has three children. His wife has also left him. “I had a habit of blaming her for all the ills in our lives. One day she just about had enough and disappeared” he says. The role of a sole parent is tough for him. He acknowledges that it is not easy to raise the kids. He admits that the children especially those of his brother are unruly and out of control. There were numerous aid and development organisations in Gulu during the time the LRA terrorised northern Uganda. Now in peace time only a few are present. When the LRA left the region, the aid workers also packed their bags and travelled to other hotspots in the world. The Acholi are left to apparently damp down themselves. Uganda has 29 psychiatrists, most of which work in Kampala. Only one is practicing in Gulu and teaches at the same time at the local university. The investigation into the suicides by local authorities shows that most people are not aware that there are people like psychiatrists and psychologists who are trained to help patients with mental problems. Psychiatrists warn of copycat suicides by children. “I fear that there will be no quick end to this wave of suicides. Rapid action is needed to prevent more”, says Professor Raymond Odokonyero, a psychiatrist. He believes the solution lies in stationing psychotherapists in the Gulu area to identify possible suicides and threats. They would be the ones that can identify potential suicides and take action. “It is clear that the departure from the camps did not end the problem”, concludes the psychiatrist. For such a large-scale action lots of government money is required. But the budget of the Ministry of Health has recently been reduced which resulted in hospitals lacking medicines. Mental health is not on the priority list of the ministry. On top of it all more than 12 million Euro, raised by donor countries for the reconstruction of the north, has disappeared within the extremely corrupt Ugandan government apparatus. Foreign governments suspended financial support to the government as a retribution. Some Ugandan officials have been transferred and the minister has apologized. But money remains not forthcoming. The north is underdeveloped in comparison with the rest of the country. The roads are extremely bad, the houses are crumbling and electricity is for the most part lacking. Northerners believe they are deliberately forgotten by the government of President Yoweri Museveni. Acholi constituted the bulk of the army under President Milton Obote, the dictatorial leader who was driven out by Museveni in 1986. Obote’s army was guilty of heinous war crimes against civilians. The population in the North is convinced that they would be marginalized out of revenge. Writer Lamwaka fears that the frustration and dissatisfaction with the situation in the north could lead to an outbreak of violence. A boy walks up with a squeaky wheelbarrow filled with sugarcane. The youngsters wake from their slumber and get up. For some coins they buy a piece of sugarcane and start chewing and sucking. “That chases away my hunger pangs”, says an almost toothless young man. An approaching truck slaloms between potholes and asphalt rocks. One of the youths, half joking, half serious, jumps up and stands in the middle of the road. “Come, come! Make me flat”, he yells. 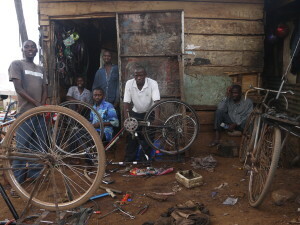 The bicycle repairer quickly grabs him by the arm and pulls him to the side. He does not say a word, just shakes his head.